Recently, Prima Marketing and I came out with some alcohol marker palettes to be used with my doll stamps. Now, I don't claim to be one of those amazing marker artists out there, let's just get that clear. As you all know, I love my text paper...any kind of text paper...scrapbook paper, newspaper, old maps and documents. You name it, that's what I like to stamp my dolls on. But I have to admit, I like a little shading. It just adds that touch of depth, that feeling that hey, maybe I am a real artist! 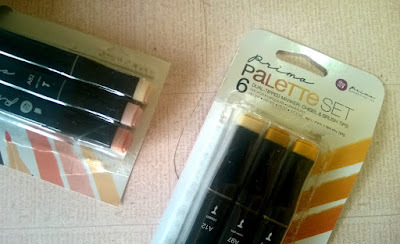 The only markers that gave me the look I wanted were alcohol markers and we know how expensive and well for me, how overwhelming it is to go through all the colors to find the exact one I needed. 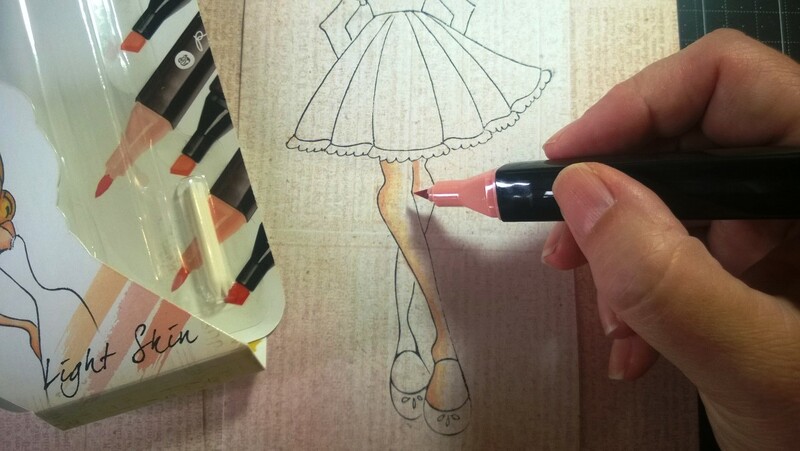 These markers come in many palettes for skin and hair tones as well as some basic colors that I like to use for shading the clothes. Remember the reason I have always used text papers since I started all my doll stuff back in 2007...I didn't have to be perfect at shading the skin. I didn't have to be a real artist! I could be the totally imperfect artist that I am and get away with it. 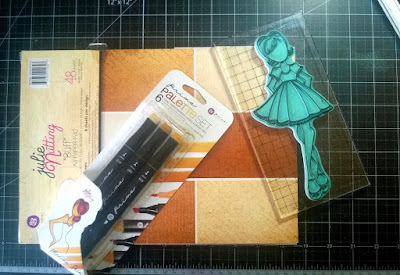 So here are my tips for using theses new markers my way. These markers go perfectly with the Buff Paper Pad by Prima. 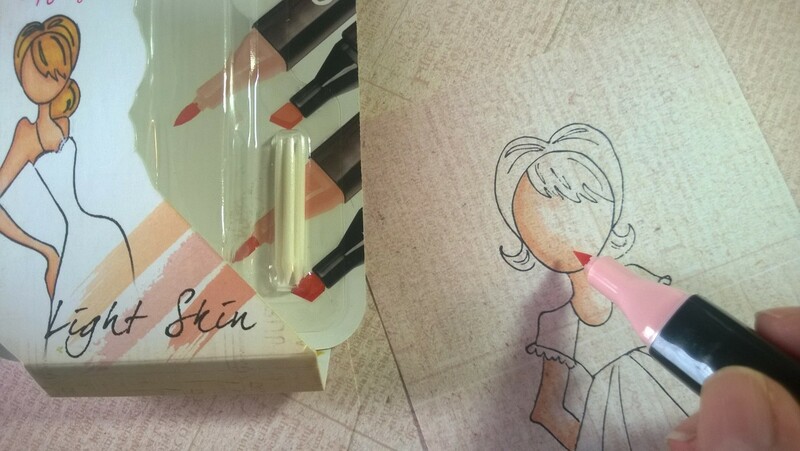 All different skin tones come in one handy A4 pad. Be warned though, not to depend on the numbers on the markers to figure out the different shades. We do not number them. They come that way from the manufacturer. There is a reason, a very technical one but I am not here to bore you with that. Just always test your colors first. My first tip of the day...I cut off the top of the package so the markers slip right out. I keep them in their packages so I know the light skin tones from the medium ones, etc. I also write the numbers on the back just in case I get mixed up. I keep all the sets in a small handled shopping bag so I can see all the colors at a glance. It slips right under my desk. 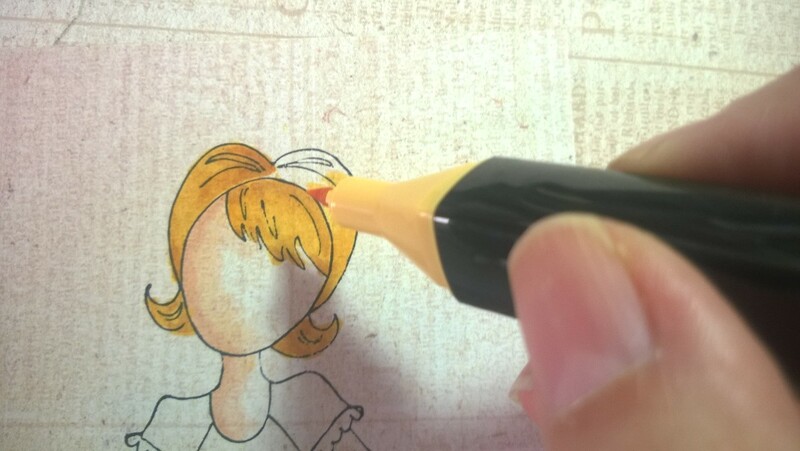 I stamp my image with Archival ink and give it a few seconds to dry. I am using the Light Skin palette for this on the light tone paper from the Buff paper pad. I picked a side, the left and shaded it with the medium tone marker, #83. You could use the darker tone, #84 for this step if you want it a little bit more pronounced. There is no right or wrong way and I encourage you to play with the colors to see what you like. I used the lightest tone marker, #82 to blend the darker shade into the paper. Keep this particular color handy...I use it a lot. I don't do any of the fancy schmancy flicking, I just simply blend the colors. Bamm! Skin is done! Easy peasy. Let's make Candie a blond today. Using a more traditional approach, I brush the lightest tone of the blond palette, #17 in the center of all the hair sections. I then brush the medium tone in the empty spaces. I like to stagger my edges for texture. I blend the colors with my lightest pen from the light skin palette # 82. There is also a blender pen but for some reason I just prefer that light pen to blend with. I place just a tiny bit of the darkest tone #19 at the roots, top of bangs and the side curls and blend again. Done! Cheeks! 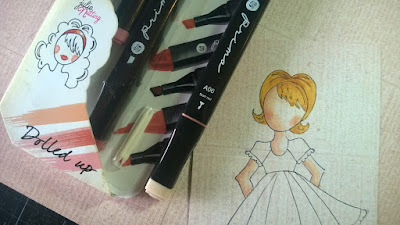 We have just the set for that... Dolled Up! I used the lightest shade #1 and blended it with my # 82 from the light skin set. I think she's now ready to get dressed! This set is a perfect example of the numbering system not being in the order we think it should be in so be careful. There are sets in different colors too, greens, teals, purples, reds. 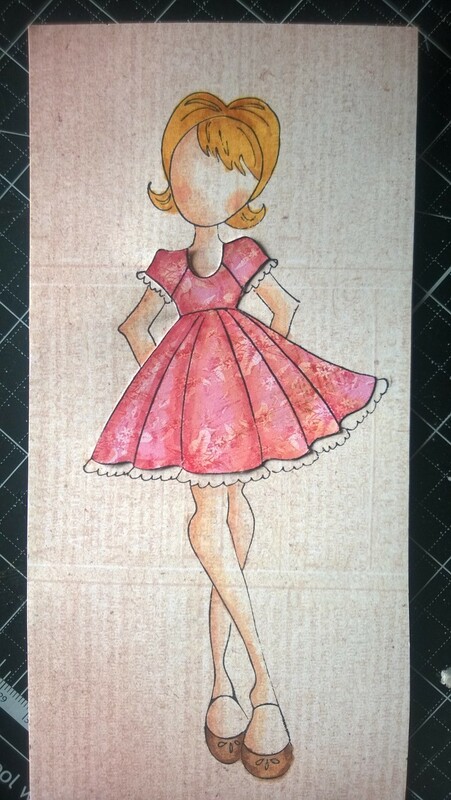 I love to shade the folds in the dresses to give them some dimension. 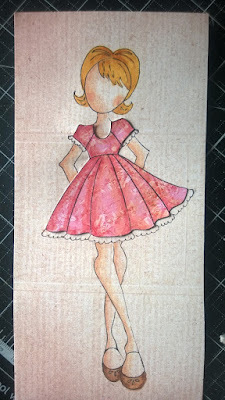 I stamped the dress on a new paper from the Garden Fable collection and I'm going to use the Dolled Up set because of their pink tones. On the left side of the dress, I used the darkest tone, #3 and on the right side of the dress, I used #6, the medium tone just to show you the difference. I blended again with The #82. All dressed and ready to go! I did her shoes with the Brunette set. You can see I am not the proficient alcohol marker artist but these pens give me just the right shades for what I want to achieve with my dolls. Notice how I shaded just the left side of her skin. Simple, fast and oh so cute! 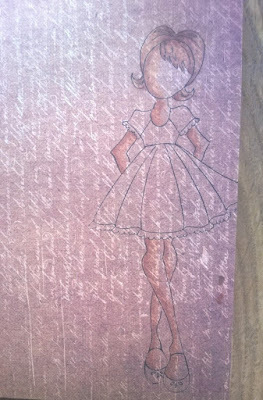 Sorry, my lighting is terrible today but I wanted to show how nicely using the dark tones work with the Buff paper pad. 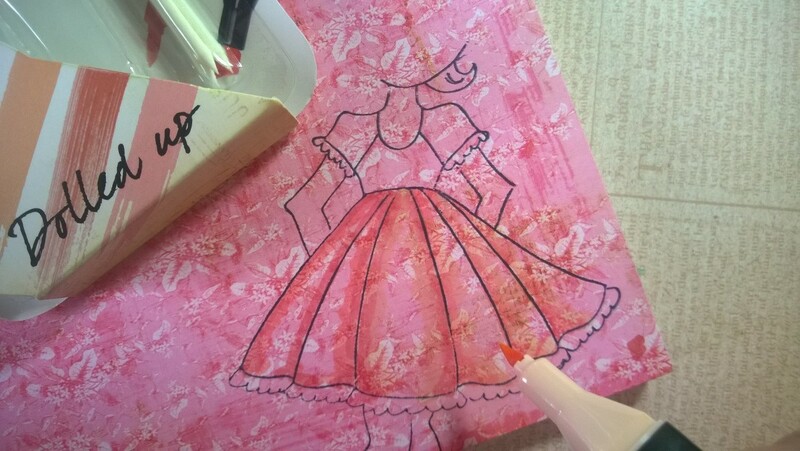 I used only one color and simply blended it into the paper. Im always a big fan Julie !!! Lovely! I love how you color the dolls. Excellent! 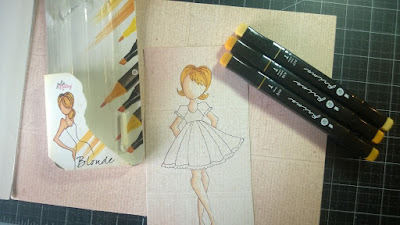 I just purchased my first 3 Doll stamps, I came home inked them up and stamped just to get a good look and WOW, your stamps are so clean and crisp I love them and can't wait to get more. They will be in lots of my future art journaling, am so excited about them.